The RTU office will be closed from July 6 until August 21. Have a great summer! If you would like to read the RSB proposed Policy on Language Development and Delivery Models or the public consultation document prepared by RTU, please download the files below. 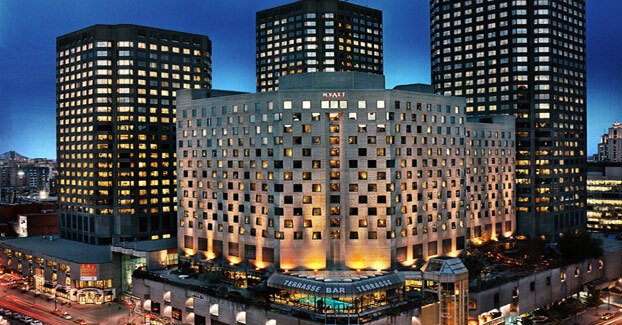 The 2017 QPAT Annual Convention will be held November 23-24, 2017 at the Hyatt Regency Montréal. To read the program, please download the file below. ​Since This Changes Everything was published, Klein’s primary focus has been on putting its ideas into action. 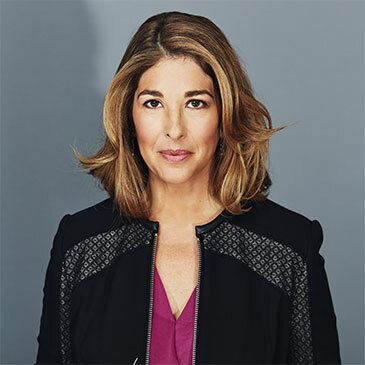 She is one of the organizers and authors of Canada’s Leap Manifesto, a blueprint for a rapid and justice-based transition off fossil fuels. The Leap has been endorsed by over 200 organizations, tens of thousands of individuals, and has inspired similar climate justice initiatives around the world. She has multiple honourary degrees and in 2014 received the International Studies Association’s IPE Outstanding Activist-Scholar award. In June 2017, she will be releasing a new book called No is Not Enough: Resisting Trump’s Shock Politics and Winning the World We Need. We are delighted to welcome Mario Cyr, internationally renowned cinematographer and deep-sea explorer, as our second keynote speaker. His presentation will take place on Friday afternoon in French. 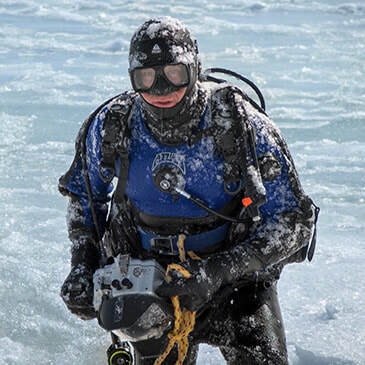 Regarded as a world expert in cold-water diving, Mario Cyr is known internationally for his breathtaking images. With more than 500 conference-presentations to his credit, accounts of his incredible adventures have fascinated people here, in Europe and even in Asia, where his photos appear in major expositions and even on the cover of magazines. His talent as a science communicator has enabled him to catch the attention of hundreds of students in school presentations, to sensitize them to the importance of effort and perseverance, and to raise their consciousness about environmental issues as well as the importance for humanity to preserve this precious heritage. Contributed sequences to the most spectacular scenes of the famous film Oceans directed by Jacques Perrin, a film that won a César for best documentary. He won first prize at the Antibes World Film Festival for his documentary Toothed, as well as winning an Emmy nomination for Ice Bear 3D. OTTAWA – Safe and caring schools are a top-of-mind priority for the Canadian Teachers’ Federation (CTF) as it highlights this year’s World Teachers’ Day on Oct. 5. 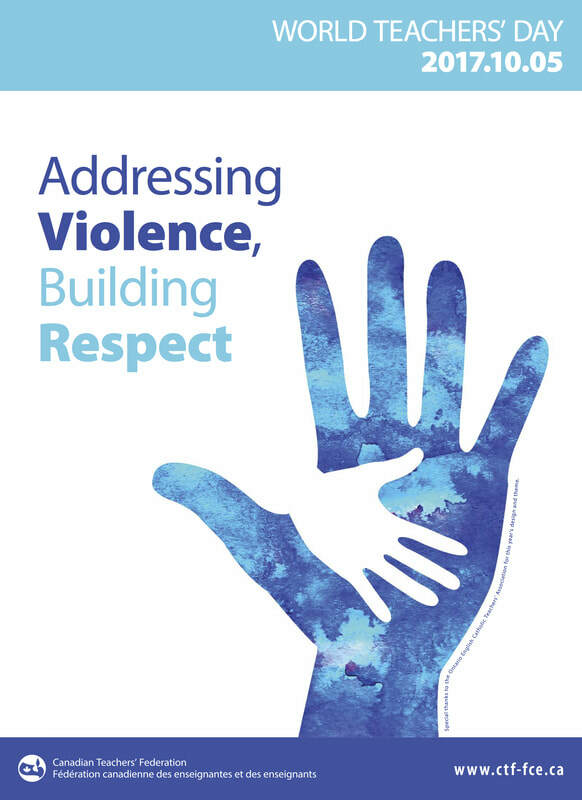 The Federation chose the theme because of a growing concern expressed by its Member organizations about violence in school. The CTF President also highlights the toll this can take on teachers. Constant and unreasonable expectations, heavy workloads, threats of violence by students, lack of educational support, and limited access to often inadequate mental health services for students can lead to increased work-related mental health conditions such as depression, anxiety, and burnout. “Austerity measures in education have exacerbated challenging situations in schools and the reality is that too many now face diminishing resources and larger class sizes. Teachers’ heavier workloads can result in less time to devote to the educational needs of students and/or an increase in work-related stress leading to burnout,” explains Ramsankar. In a 2014 CTF national survey, 90.6% of over 5,000 teachers who responded indicated safe and caring schools as a major priority for the Federation’s advocacy efforts during the 2015 federal election. Over 95% of teachers indicated that student mental health and well-being was the top priority. In another CTF survey conducted in 2014, 95% of more than 8,000 teacher respondents experienced stress because it is harder to find time to meet the individual educational needs of students. Teachers also said they don’t have adequate supports and services to address the broad range of special needs in their classrooms. In a 2012 CTF survey of nearly 4,000 teachers conducted in collaboration with the Mental Health Commission of Canada, 89% of respondents said there is a shortage of school-based mental health professionals. Founded in 1920, the Canadian Teachers’ Federation is a national alliance of provincial and territorial Member organizations that represent over 232,000 teachers across Canada. CTF is also a member of Education International. @CanTeachersFed and @EnseigneCanada. Take a look at one of the great projects our colleagues at MTA are undertaking. $300 Project Subsidies are Available! School-community project subsidies are available to classrooms and school clubs. This is a wonderful opportunity to engage your students in social action projects that seek to address poverty in our communities, or address human rights, or challenge mental health stigma in your school, or any other social justice issue of importance to your students. Perhaps you even wish to become a Fair Trade school. To create a project and apply for funding, please login or create a profile and select the social action project subsidy. Join the 170,000 students in Canada engaged in over 590 school-community social actions projects. You have until June 30, 2018 to complete your project. If you want ideas, browse our public showcases on Imagineaction. Join the 3,000+ teachers registered with Imagineaction! Hope to see your application soon!! For a version of this information with hyperlinks, please click here. ﻿QPAT President, Sebastien Joly, has been interviewed in the media regarding the rushed implementation of Quebec's new financial literacy course. He was interviewed by the CBC News and on Daybreak. Great news! As of September 15th, pharmacists in Quebec will be required to reveal mark ups and dispensing fees. Our members will finally have the information that has been provided for years in the rest of Canada. ​We encourage members to shop around for their benefit and that of our plan. Please see the attached document for more information. The Quebec Government held a press conference regarding their Policy on Educational Success. QPAT president, Sebastien Joly is quoted in the CBC News article. Follow the link. QPAT is accepting proposals for workshops for the 2017 QPAT convention. If you would like to present, please complete the forms below or visit the QPAT website. The deadline to submit workshop proposals in May 5, 2017. Namuwongo Project ($1000): We continue to this organization which was created by two QPAT members. They have built schools i nthe slums of Uganda (Namuwongo) allowing for 20 children to attend school and get at least one meal per day. 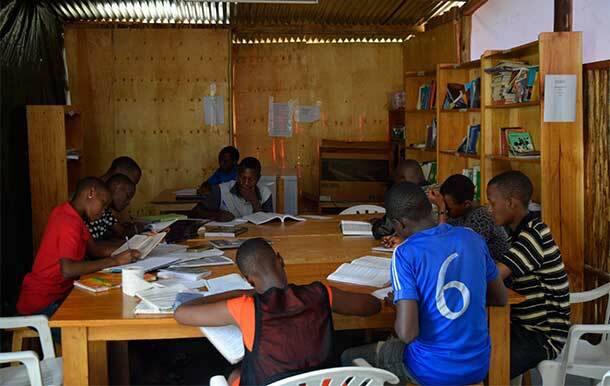 OSU Children's Library Fund ($1000): A Canadian women has created 7 major libraries and written dozens of books to teach children and adults living in Ghana how to read. This donation will give one child access to an entire secondary education. 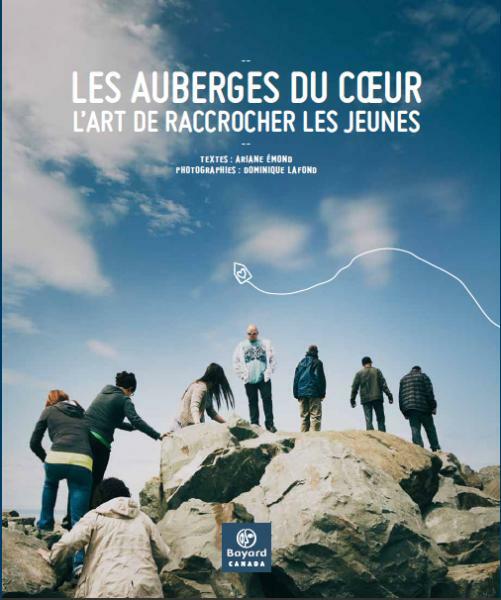 Les Auberges du Coeur ($2000): These shelters provide support to youth aged 12 to 30 going through difficult situations with tools to turn their lives around. The Government of Canada values the contribution teachers make providing young Canadians with the education and skills they need to join a strong middle class. There is a new refundable tax credit for 2016 and beyond: the Eligible Educator School Supply Tax Credit. If you are an eligible educator you can now claim a 15% refundable tax credit on up to $1,000 of supply purchases per year. Some examples of eligible supplies include: construction paper; flashcards; items for science experiments; art supplies; various writing materials games and puzzles; books for the classroom; and educational support software. ​If you claim this tax credit, the CRA may ask you to provide a certification from your employer attesting to the eligible supplies expense. You should request the certification from your employer in a timely manner and keep it in your files, along with your receipts, in case the CRA requests it. For more information, go to this website, or consult the Department of Finance Canada's Budget 2016 documents. 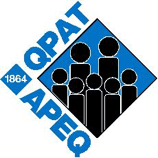 QPAT hosted its annual convention on November 24th and 25th at the Palais des Congres in Montreal. Yet again we saw a gathering of thousands of teachers from around the province with an attendance increase of 10% over the 2015 convention! Over one hundred workshops on a variety of topics were held. Friday's workshops were especially well attended with over 1500 participants! The exhibition hall was popular on both Thursday evening and all day Friday. The addition of the EdTechTeam's interactive educational technology center was especially appreciated and well attended, with hundreds participating in the various interactive activities. Our Thursday evening keynote speaker, Dr. Stanley Vollant, was by turns amusing, poignant and informative and left the large gathering with plenty to think about – not to mention some great ideas for lessons about First Nations' issues. Our Thursday evening social event was lively and fun with lots of dancing and door prizes. Thank you to everyone who helped make this year's event such a success! We are already planning for next year's event, tentatively scheduled for November 23rd and 24th 2017. Consultation on Educational Success - Sebastien Joly, QPAT President, December 1, 2016. In response to the public consultation on educational success, QPAT has prepared a brief that has been presented to the Minister of Education, Leisure and Sport. Town hall consultation sessions with the Minister of Education have been taking place throughout Quebec. Representatives of RTU and CVTA (Chateaugay Valley Teachers' Association) were present on November 21 at the consultations for the Montérégie. If you are interested in a detailed brief of QPAT's position, download the file below. The Canadian Teachers’ Federation (CTF) needs English and French-speaking Canadian teachers at the elementary and secondary levels who are interested in volunteering to offer in-services in a wide range of subjects in countries throughout Africa and the Caribbean. Many current projects include literacy acquisition, gender equality, special education and peace education as well as the core subject areas of English, Math, Science and Social Studies, within a child-centred methodology. Each year, close to 60 Canadian teachers are chosen to volunteer on CTF’s Project Overseas. On PO, Canadian teachers give their time and talent to offer professional development in-service programs in partnership with teacher organizations in developing countries. Based on requests from CTF’s partners overseas, teams of Canadian teachers are formed in January and in-service projects take place in July and August. 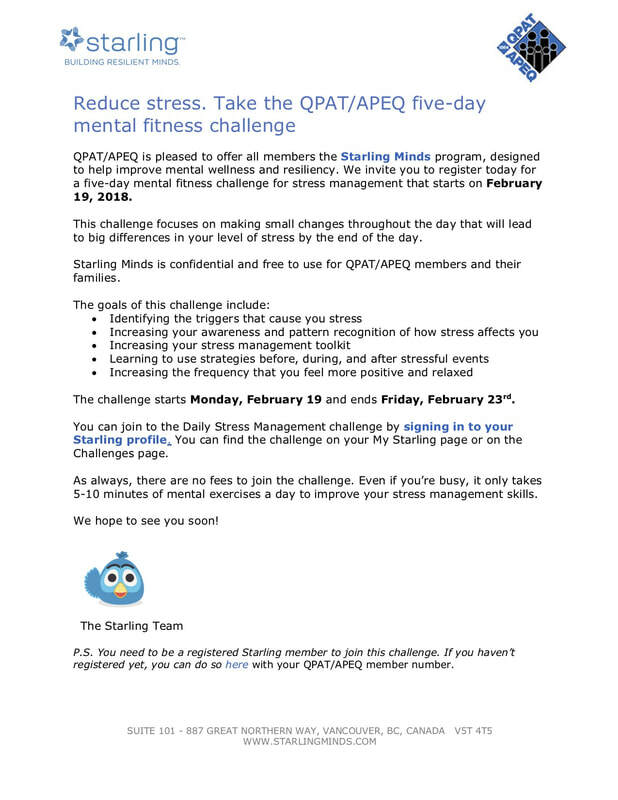 Starling is an online mental health and wellness tool that helps you assess, monitor and improve your mental wellbeing. It’s an interactive, online program that teaches you about your mental functioning and gives you practical techniques for building stress resilience and boosting mental fitness. As a member of a QPAT affiliated union, it’s available to you to use anywhere and anytime you want, for free. And it is and will always be 100% confidential! N.B. 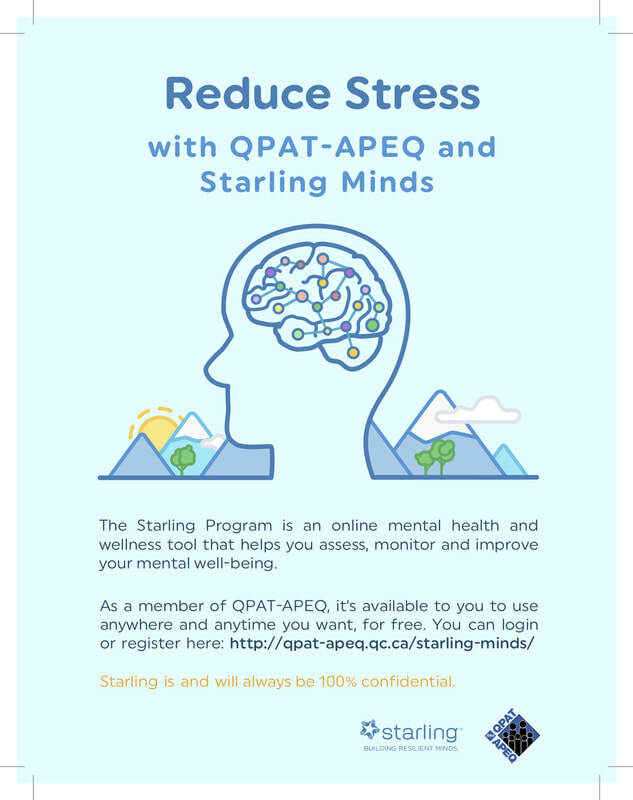 : Your school board is not involved in this project and will NEVER have access to any information relating to your personal use of the Starling Minds program! ​The program of the QPAT Annual convention, to be held at the Palais des congrés de Montreal on November 24th and 25th, is now available. ​It can be downloaded here. On October 29 & 29, the RTU Delegates' Workshop has held at Château Bromont. Delegates had a chance to discuss best practices with one another, as well as participate in workshops presented by QPAT staff. Thanks to all the Delegates for attending on a weekend during the busy time of year. Much thanks to all the RTU and QPAT staff for organizing an enjoyable and informative workshop. ​The Report Card on Quebec’s Secondary Schools 2016 ranks 459 public, private, Francophone and Anglophone schools based largely on the results from province wide tests in French, English, science, mathematics and history. ​The Report Card provides parents and educators with objective information that’s difficult to find anywhere else, which is why it’s the go-to source for school performance in Quebec. 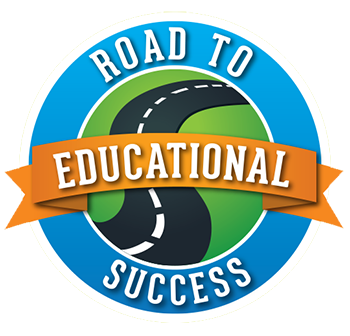 To see the detailed results of all schools ranked, go to compareschoolrankings.org. ​The 2015-2016 lump sum payment and retroactive salary to April 1, 2016 may impact amounts received by teachers receiving QPIP or Employment Insurance benefits. QPAT has prepared documents explaining the how teachers receiving these benefits may be affected. Dr. Stanley Vollant grew up in the Innu community of Pessamit in the Côte-Nord region. Dr. Vollant obtained an MD diploma from Université de Montréal in 1989. He completed his training in 1994 with a specialization in general surgery, making him the first Aboriginal surgeon in Québec. Among his many achievements, he represented 9,000 doctors as the president of l’Association médicale du Québec and served on the Executive Board of the Canadian Medical Association. Dr. Vollant currently travels on footpaths trodden by his ancestors, the Innu Meshkenu. His work aims to facilitate the meeting of people in First Nations’ communities and neighbouring communities to inspire young people about the importance of education and the acquisition of healthy habits. He began his march totalling nearly 6,000 kilometres in the fall of 2010 and expects to complete his journey in 2017. 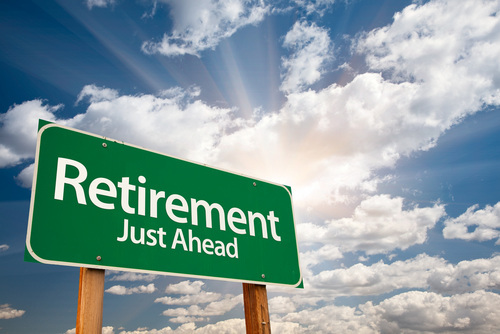 The Quebec Provincial Association of Teachers (QPAT) will be providing information sessions to teachers who plan to retire by the end of the current school year (2016-2017). Registration for all sessions will be conducted online and is mandatory given space constraints. The Pre-Convention Workshops will take place on Thursday, November 24, 2016 from 9:00-15:00. The cost of a pre-convention activity is 100$. There are facilities for lunch at the Palais des Congrés and the cost is included in the registration fee. You can download the Pre-Convention information below. Riverside Teachers' Union has created a new logo. It symbolizes the connections create with our community and our colleagues. There is a draft version in French of the new Collective Agreement on the CPNCA website. The 548$ lump sum and 1.5% increase retroactive to April 1, 2016 will be paid by Riverside School Board on the September 22, 2016 pay. ​The 2015-2020 collective agreement between QPAT and the CPNCA was signed June 16, 2016. It provides retroactivity on salary. This retroactivity will be paid before September 30, 2016 for all those employed during the 2015-2016 school year. Teachers who only worked during the 2014-2015 school year will be paid retroactivity fifteen days after those who worked the 2015-2016 school year.